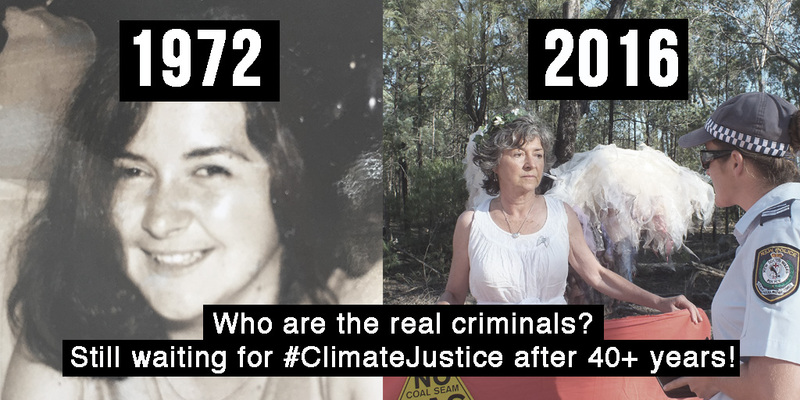 After three years of peacefully protest-performing without any significant personal risks, a flock of Climate Guardians was finally arrested and criminally charged on 9 February 2016 in the Pilliga State Forest in Northern New South Wales. Given the long history of connivance between destructive industries and decision makers—and the sharp rise in draconian laws to restrict protesting—we’re pleased to share some important lessons from our brush with the law. What did Angels do to receive criminal charges ? 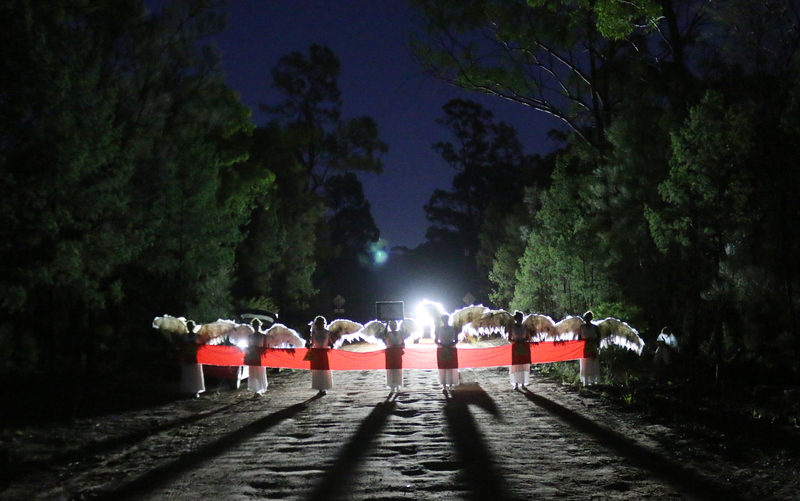 Starting before dawn—holding the red line of fabric that led thousands of people through Paris in COP21’s D12 March—a flock of seven Climate Guardians blockaded a road leading to Santos’ Narrabri Gas Project. Involving the construction of 850 coal seam gas (CSG) wells in the Pilliga State Forest, the project is highly controversial because: 1) the area sits above a critically important ‘recharge zone’ supporting the crucial pressure head enabling ground water from the Great Artesian Basin to flow to the surfaces of the massive expanse of farmlands dependent on it, 2) gas rigs leak methane (aka ‘fugitive emissions’) which is around 85 times more potent than carbon dioxide in the atmosphere, over a 20-year time span, and 3) the project’s waste water treatment plant is currently the subject of a legal challenge re the validity of its permit. As was explained at every stage of the blockade, the Climate Guardians sole aim was to prevent Santos drillers from getting through to the gas project site in the Pilliga Forest. In fact on several occasions security guards working at the site passed through the blockade. Had any general public appeared there would have been no question as to their rights to pass through to the forrest. Notably the young female officer in charge of our arrests was obviously being overseen by a much older male policeman. By the time the last Angel was arrested the young officer was so stressed that she could barely speak and fumbled her directive. We were all stunned by the raw patriarchy on display. Whilst what followed wasn’t pleasant it wasn’t violent. Having said that, pain compliance was used even though the Angels were entirely passive. Given the ongoing gruelling job of maintaining the Pilliga Push blockade day in day out it’s understandable that some activists were feeling beyond frustrated. Protecting common assets from destruction at the hands of profiteering industries and governments shouldn’t be the job of ordinary citizens. Having said that, it wasn’t helpful that some activists were venting their justifiable anger and heartbreak in abusive and abrasive ways towards the officers whose job is to simply uphold laws. Even obviously crap ones*. Wise to its inherent power, the Climate Guardians resonate peace and determination. Just a glimpse of human history shows how brutal authorities can be when things turn really stressful on the streets. Given the challenges ahead, surely it’s better that police view environment activists as caring and deeply committed citizens as opposed to serial troublemakers as industry and government are so adept at framing us. One by one five (of seven) of the remaining blockading Climate Guardians were arrested and removed to enable Santos’ workers to pass. In two vehicles the Angels were taken to the Narrabri police station for processing. During the roughly four hours this took the Angels were treated respectfully, including being offered cuppas and lunch. This down time enabled meaningful, respectful exchanges with police officers. As expected, we heard that defending blockades is not what officers signed up for and they’re unhappy. It’s clearly evident that the already major challenge of keeping law and order in the 21st century is significantly more stressful and complicated in communities at the gas and coalface. The fact that Santos workers cannot currently access their worksite in the Pilliga forest without a police escorts says it all. Meanwhile just up the road, another community blockade was reopening that weekend. That blockade aims to protect what remains of the Leard State Forest—including one of the Leard’s last remaining Gomeroi sacred sites—from further destruction by Whitehaven Coal (chaired by Australia’s former Deputy Prime Minister) and Idemitsu Coal. Further to this – thanks to a Freedom of Information request from The Wilderness Society to see government documents re the new anti-protest laws – it has come to light that there exists ‘a very close and cosy relationship between Santos and the NSW government’, with the office of Energy Minister Anthony Roberts supplying a draft of a key speech just hours before he delivered it in parliament. 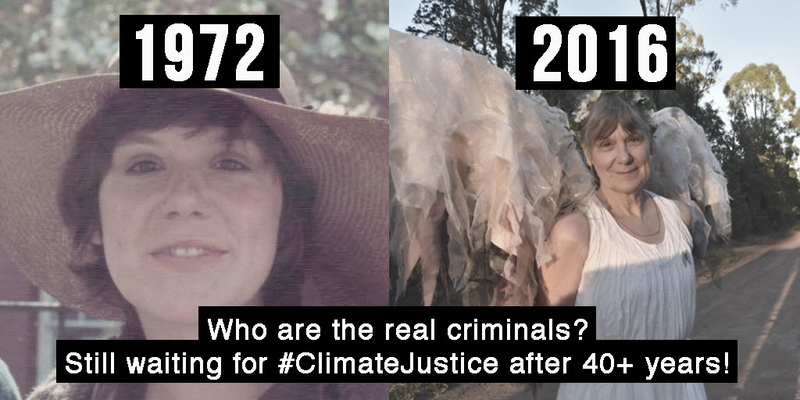 Re our case, with brilliant legal defence from Kira Levin of EDO NSW, the Climate Guardians appeared at Downing Centre in Sydney on 30 May 2016. In driving home the seriousness of our offences, in his opening statement, the Magistrate advised that the penalty for our actions could result in a maximum of two years imprisonment. It was obviously a relief when he then proceeded to insist that was not going to happen in his courtroom. The Magistrate gave a sincerely caring and persuasive argument as to why our actions were to be taken seriously. He asked us how we would feel if the rioters who had descended on the previous weekend’s anti-racism protest in Melbourne (attended by one of the charged Angels) had been treated leniently. He finished by advising that next time we are in between the bulldozers and the police, remember that when they say it’s over or have placed us under arrest, that’s the time to end the protest. Having no choice but to plead guilty as charged, our plea did not proceed to convictions, or fines. We remain on 12 month good behavior bonds in NSW only. It was the best possible outcome. With utmost respect for those whose jobs it is to uphold the law, since the beginning of time no crap laws have been successfully challenged without resorting to direct action. A century earlier our grandmothers, with support from some good men, were hunger striking in prisons to challenge laws that treated women as the property of men. 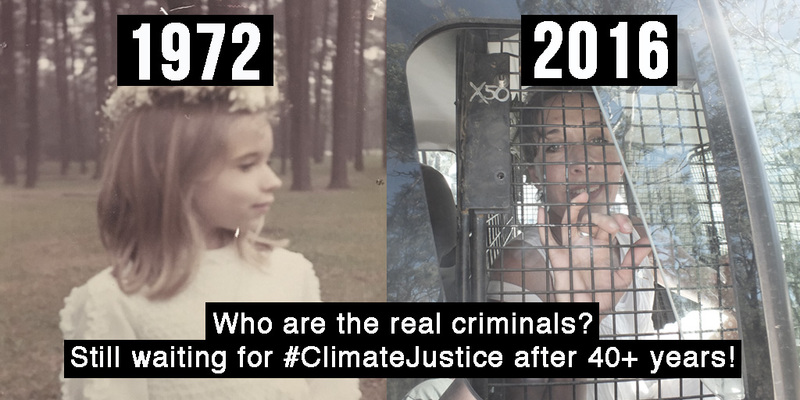 We knew we’d be arrested if we got between fossil fuel extractors and the resources they are profiting from. We also knew that with so many cameras on us—and the support of some genius social media Angels—we had a good chance of helping raise significantly more awareness for the cause. And as luck would have it, the producers of the Gruen Transfer—who were filming at Downing Centre for a new series exploring legal proceedings—heard about our case and requested that they change courtrooms to film our hearing. Following the verdict the production team filmed extensive interviews with the Climate Guardians. Given how difficult it is to be heard over industry and conservative commentators, this random, sweet twist of fate made it all feel worthwhile. We gratefully acknowledge the wonderful and dedicated support of EDO NSW , the kind people who provided us with outstanding character references and the Pilliga Push community that has worked so tirelessly to protect the Pilliga Forest, the Great Artesian Basin and the global climate from Santos’ destructive project. * Laws exist to protect the greater good. Yet it was only a blip in time ago that some humans legally exploited others mercilessly to their deaths. That our current laws defend the perpetrators of irreparable damage to the ecosystems that support all life on Earth—healthy soils, water and air—is clearly unnacceptable. We must fight for human laws that respect nature’s non-negotiable laws (aka physics) on which all life depends. ^ Note that NSW’s legal community responded with alarm. In its submission to the proposed legislation the Law Society of NSW expressed grave concerns about the apparent “trend of expanding police powers without corresponding judicial and other safeguards” suggesting that the new laws “encroach upon and limit fundamental rights to assemble and protest” and that “such a trend would represent an erosion of long-standing democratic institutions and individual rights”. The NSW Bar Association argued that the laws remove protections for political activities that have “properly been regarded as an essential part of the social, political and cultural life of any civilised society.” Also note that the new laws still had not come into affect by the time of our hearing.